For the 2016 Kranzberg Exhibition Series, Laumeier presents Alison Ouellette-Kirby and Noah Kirby: Arena at the outdoor Amphitheater in the Way Field. 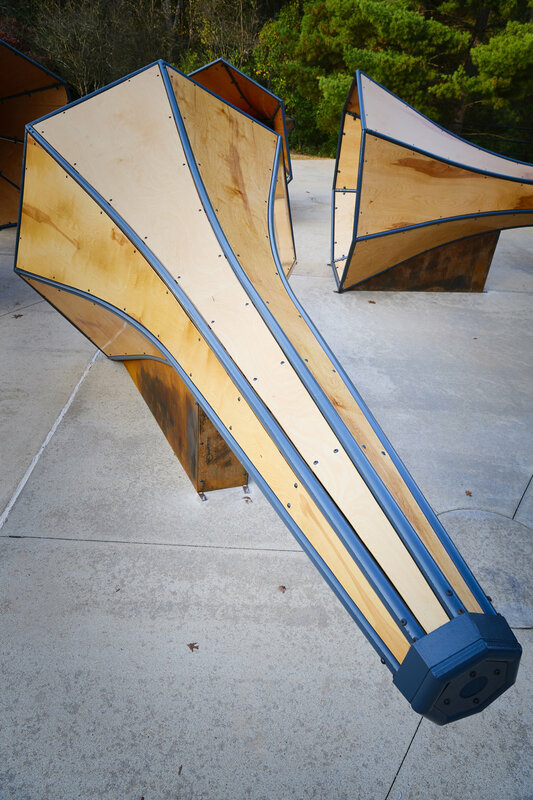 The massive structural installation consists of five sheet-metal megaphones with an interactive audio element. Inspired by their previous Tone Deaf series, the artwork incorporates a mechanism that translates and projects visitors’ voices into harmonic gibberish as a response to the flora and fauna in the Park. In their collaborative practice, the Kirbys create forms through the traditions of casting and fabrication. Their combination of material confidence and technological play often develops into environments and scenarios that are complex, ambiguous and situational. This large-scale commission expands on their shared artistic production by utilizing the public’s language and speech to more directly communicate with the natural environment at Laumeier. In the Kirbys own words, "Arena addresses the inevitable distortion of a singular voice when expressed in the public sphere. Acting as a space that magnifies this distortion, Arena becomes a closed-off space within a larger, public realm that explores the vagaries of the power of one’s voice." Alison Ouellette-Kirby received her B.A. in sculpture and photography from the University of Windsor-Ontario in 1993 and her M.F.A. from the University of Tennessee, Knoxville, in 1996. Her work has been shown both nationally and internationally at Burris Hall Gallery, New Mexico; Highlands University, Las Vegas; University of Wyoming, Laramie; Regional Arts Commission, St. Louis; National Ornamental Metal Museum, Memphis; Schmidt Art Center, Southwestern Illinois College, Belleville; Perkinson Gallery, Kirkland Fine Arts Center, Millikin University, Decatur, Illinois; Kemper Art Gallery, Kansas State University, Manhattan; Art Walk Gallery, Hays, Kansas; Thames Art Gallery, Chatham Cultural Centre, Chatham, Ontario; Applebee Gallery, MacMurray College, Jacksonville, Illinois; Biggin Gallery, Auburn University, Alabama; Y Gallery, Granite City, Illinois; Pitt County Arts Council, Greeneville, North Carolina; Peter Youngers Fine Art Gallery, Northeast Junior College, Sterling, Colorado; Gallery 130, University of Mississippi, Oxford; and Good Citizen, St. Louis. Ouellette-Kirby is a professor of art at St. Charles Community College. Noah Kirby received his B.A. from the University of Tennessee, Knoxville, in 1998 and his M.F.A. from Washington University in St. Louis in 2000. Kirby has worked for Cassilly, Inc. at the City Museum and runs N.K. Metalworks, both in St. Louis. His work has been shown nationally and internationally at Finder Arts District, Nanjing, China; National Ornamental Metals Museum, Memphis; University of Wyoming, Laramie; Millikin University, Decatur, Illinois; Thames Art Gallery, Chatham, Ontario; MacMurray College, Jacksonville, Illinois; Moss Thorn Gallery, Hays State University, Kansas; Auburn University, Alabama; Burris Hall Gallery, New Mexico Highlands University, Las Vegas; Gallery 130, University of Mississippi, Oxford; Good Citizen, St. Louis; Kidwelly, Wales, United Kingdom; Northeastern Junior College, Sterling Colorado; Powerhouse Gallery, Sloss Furnaces National Historic Site, Birmingham; Appalachian Center for Craft, Smithville, Tennessee; and String Gallery, Toronto, Ontario. Kirby currently teaches at Washington University in St. Louis and the University of Missouri-St. Louis. He is the co-director of Six Miles Sculpture Works and 50 Brick Artist Residency in Granite City, Illinois.